Since I’ve started sewing I’ve heard repeatedly how hard Minky is to sew with. So, I tried it finally and loved it! I used my walking foot, and pinned like crazy, and had no stretching at all. I think I’ve found a new favorite for baby quilt backing. 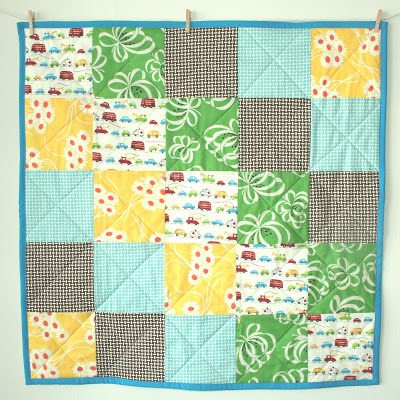 Except now I really really want to make myself a big huge minky backed quilt for myself to snuggle with. So if you have yet to sew with Minky, here are some helpful tips I read before hand. 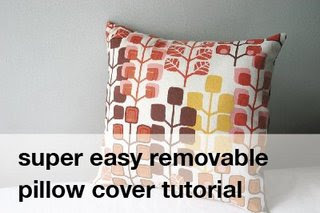 And…….I’ve been meaning to do a pillow cover tutorial for awhile now. But I was so excited when I saw Candice at Sparkle Power made one instead! (one less thing for me to do!) So head on over if you need some new springy pillow covers like I do. P.S. and her blog is great too. full of great vintage finds. And she’s a fellow Clevelander. And we are probably both enjoying this wonderful sun and 50 degree weather. I feel the same way about minky — I use it with everything! I’m not crazy about quilting with it, so I quilt the front with muslin and then attach the minky to the back. Extra soft! I think the block switch was a happy accident-more interesting that way! I have not worked with minky yet, but I hear it’s very soft. I love how this quilt turned out! You know, I think things that are homemade aren’t supposed to be machine-perfect. They have more charm! 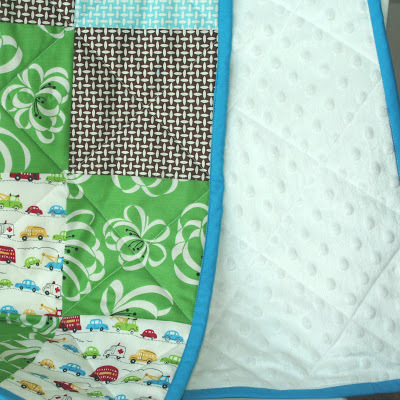 I just posted another picture on my blog of the changing mat and put links to your site. I wanted to give you credit since I had mentioned making one. Oh – and I didn’t even notice the “oops” on your quilt till you pointed it out. Minky is the best! I’m glad you tried it-I’m so excited to quilt my own blankets with a new machine. Hopefully I’ll be able to make them look decent-yours always turn out so perfect! About your "oops", according to my sister-in-law, you aren't supposed to say you made a mistake. If/when someone says you made (a mistake), you should just smile and say, "Oh no! I MEANT IT THAT WAY".